Graham Jarvis gave a masterclass of extreme riding at Tong on Sunday, winning the opening round of the 2018 ACU British Extreme Enduro Championship by over ten minutes from his nearest rivals Paul Bolton and Billy Bolt. The gap between Bolton and Bolt was considerably closer, less than half a second after two and a half hours of racing! Amazingly, this is the first extreme event where the top three places all went to four-stroke riders. racers in the morning to circulate in a roughly clockwise direction while the afternoon entrants saw the course completely reversed. The morning course was tough, all the infamous spots such as the waterfall (which riders went down) the ditch jump, the ravines and the rock garden were included but several new sections joined it all together and the whole course flowed well and had plenty of lines at the trickiest spots. Absolute carnage ruled in a couple of places during the first two laps but once everyone settled down and picked lines, it all became slightly easier, but only slightly. roots began to be exposed. Many of the sections had hard rock climbs that proved to be equally tricky. Huge numbers of spectators helped out by pulling riders up banks despite a large marshalling force present at all the tougher sections. Knight got a clean run and made the most of it keeping ahead of the pack for a couple of laps but with this type of event experience counts and one of the most experienced riders around Tong is Mark Houson in the Vets class. He eventually wrestled the lead from Knight and charged onwards, even as the last few seconds of the race ticked away on the lap clock he powered through the time check to grab another lap, the only rider to post nine laps in the morning race. Karl Greenhall took fourth overall and second in the Vets, a lap adrift of Houson, as Anthony Crowe just took third in class by 20 seconds ahead of Andy Harvey. James Crookshank had a cracking ride in the Sportsman class taking the win over Josh Haith and Jack Winn in second and third but it had been a real battle as virtually every riders was stuck at some point and the Sportsman entry was huge. 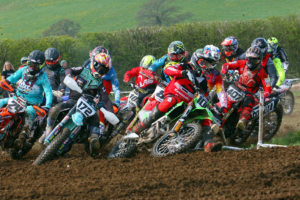 The course was the toughest ever seen for the Youth, Vets and Sportsman riders but although a few spots proved tricky the course was never altered or sections cut. Riders simply had to get on with it, which they did, much to their credit. alongside KTM’s Paul Bolton, Gas Gas Factory rider Danny McCanney, the ever improving KTM mounted Sam Winterburn and Jonno Richardson representing Beta the Championship class was packed with real talent. A new class was added to the afternoon line-up. The Elite Vets and it attracted plenty of very talented riders and yet another Knight in the form of Juan representing Gas Gas UK, this class really made their presence felt and spectators witnessed some excellent lines and manoeuvres from them. The Expert and Clubman classes were equally balanced with around 25 riders in each. As the start flag dropped it was Paul Bolton who gained the upper hand with Bolt, Jarvis and Richardson close behind. Danny McCanney got an average start but within a few minutes he had crashed and injured his hand, forcing him to retire. By the time the riders reached the ditch jump it was Bolt who headed the pack, closely followed by Richardson. The ditch was approached from the opposite side to previous years with very little run-up room and a flat take off across a very wide ditch. It looked sketchy but Bolt, Bolton Jarvis, Richardson, Ludgate and company made it look easy. There were two jump options and a slower option through the ditch itself, many riders approached the ditch and then opted for option three when they saw the width that had to be cleared. Bolt seemed to have things under control and lead for a while but then got stuck on one of the big hills, allowing Bolton and Jarvis to pass him. Bolton grabbed the lead but Jarvis hit his rhythm by the halfway point and took the lead, disappearing into the distance. He lapped the whole field up to third place and finished with over 10-minutes in hand. Who would be second went to the wire, literally. Bolt continued to close on Bolton and with the chequered flag waiving the pair approached the finish line flat out with Bolton just ahead. A last second lunge by Bolt was to no avail and he had to take third, by less than half a second. Bolton had shown he is still a force to be reckoned with and had ridden an exceptional race, especially the first half where the lead yo-yoed between three riders. Jonno Richardson took a solid fourth spot on the Beta with Parkwood Offroad’s own Will Hoare grabbing fifth. Juan Knight’s silky smooth riding style saw him take fifth overall and top spot in the Elite Vets. Where others struggled, he rode as if it were a Sunday trail ride making the toughest sections look easy at times. It was a long way to second place in the class where Harold Crawford finished 18th overall, just ahead of Andrew Reeves who took third. Sam Ludgate put on a terrific show to take seventh overall and top spot in the Expert class. He was up against some fierce competition but still managed to get well inside the top ten with second in class Chris Windle finishing 10th overall. Jack Spencer was a minute and a half behind him in third. In twenty-second spot was Stuart Mack, top Clubman rider on the day with eight laps under his belt. Thomas Johnson just made second spot on eight laps as Matthew Alpe took third in class. This was the best ever event at Tong. Switching direction for the races worked perfectly and gave the riders completely different challenges in each race and spectators plenty to watch as the action was everywhere, even on the ‘easy’ bits. It was a gamble by Fast Eddy and his crew but it certainly paid off and provided two races tougher than anything witnessed at Tong previously. It was a cracking start to a well-established series that improves year after year. Cowm Quarry with its rocks and huge twisty climbs is next in line and could not be more different to the tight, gnarly woodland at Tong. It will be the event to watch as Billy Bolt will not want to give up his British Extreme Champions title easily. Well done to all at Fast Eddy Racing, the crew, helpers and marshals made it all run like a well-oiled machine. 2019 British Extreme Enduro Championships Round 2 – Entries now open!